These bite sized treats are so versatile. They are a great snack to have in the fridge to satisfy your craving for something sweet and they would be a wonderful addition to any dinner party or desert table at an event. I’m sure you’ve seen these raspberries stuffed with chocolate chips on Pinterest. I thought they would be the perfect match for this recipe. To make them simply stuff a white chocolate chip into the raspberry. Easy! I found the recipe for the filling on a Pillsbury Mini Pie Crust box years ago. I’ve tweaked it a bit to suit my taste. 1 package of Athen’s Mini Fillo Shells. These can be found in the frozen food section near the pie shells; there are 15 per package. Heat the white chocolate in a ramekin for about 30 seconds in the microwave. Stir until smooth. 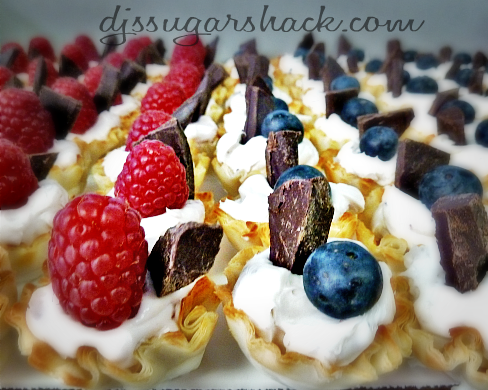 Dip the bottoms of the Fillo shells into the chocolate and set on wax paper. When all shells are dipped, place in the freezer to harden while you make the filling. In a large bowl, mix the cream cheese and powdered sugar together with an electric mixer. Slowly add the melted raspberry jam into the mixture, according to your taste. Just when I thought they couldn’t get any cuter, I made a bunch of these for a rehearsal party recently . I simply substituted blueberry jam in the filling for the ones with blueberry on top. The chunk of chocolate is Pink Himalayan sea salted dark chocolate from Chugach Chocolates, a chocolate shop in Girdwood, Alaska. They make a variety of delicious handmade chocolates & their Bavarian mints dipped in dark chocolate are a party in your mouth. 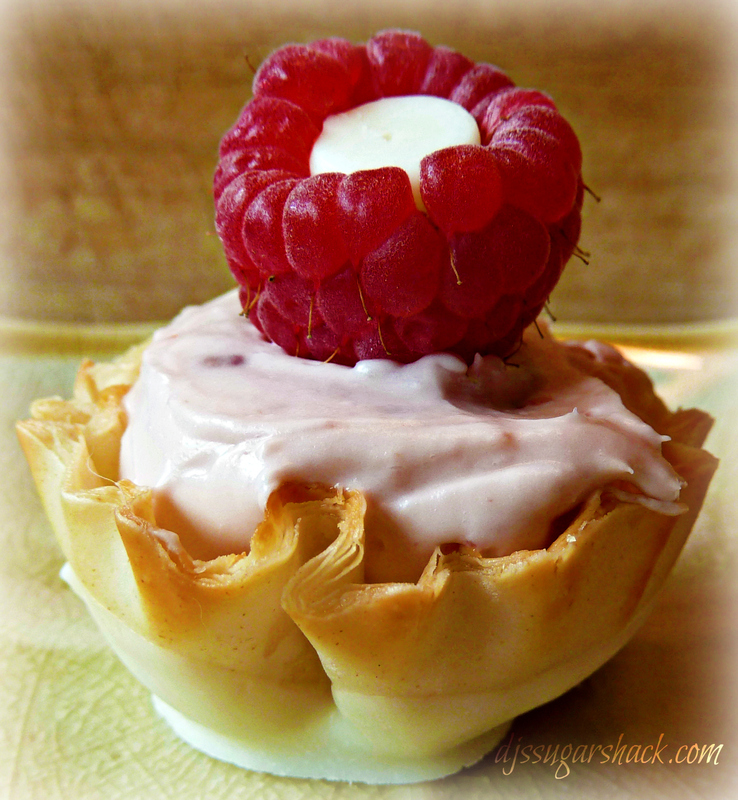 Easy to make bite size cups filled with a raspberry cream cheese filling. 1 package of Athen's Mini Fillo Shells. These can be found in the frozen food section near the pie shells; there are 15 per package. If you would like to keep updated on all the happens at DJ’s Sugar Shack please be sure to “like” me on Facebook!